Although the undersized cards have been treated to a decent run over the years, 2017 Topps Mini Baseball switches things up a bit with an online exclusive release. Instead of a full set or a traditional box format, the 2017 Topps Mini Baseball checklist shrinks all 1,000 base cards from flagship Topps and randomly issues them in foil packs. This means all 350 cards from 2017 Series 1, 350 base cards from 2017 Series 2, and 300 base cards from 2017 Update Series. Perhaps most intriguing, all key rookie cards, including Aaron Judge and Cody Bellinger, are in play. Shop 2017 Topps Mini Baseball packs on Topps. Priced at $24.99, each factory-sealed pack delivers 30 base mini cards, four base parallels, and one 1987 insert. Base parallels include Orange (#/25), Blue (#/10), Red (#/5), and Gold (1/1), while the 1987 inserts is found in base, Red (#/25) and Platinum (1/1) versions. 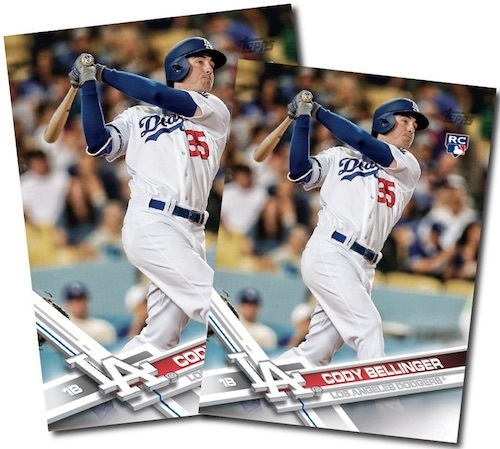 The above image provides a good comparison between the standard Bellinger rookie card and the mini counterpart exclusive to this set. Sold for approximately one month through the Topps site, supplies are limited, so they could sell out before that point. Andrew Benintendi 2017 Topps Update Series Short Print Variation (283). Review related info with our other detailed set profiles for 2017 Topps Baseball. The cost (imho) is very high considering the 1000 card pool, which leads me to ding Topps one star. Why did they not print the all-star logos on the fronts of the Mini Update Series cards? This makes them different than their original bigger brother counterparts. Will this end up making those cards more valuable, or just a stupid mistake from Topps in rushing an expensive moneymaker to market? One of the four packs I bought was missing cards, which was a bummer and compels me to ding Topps one more star on what could have been a great little five-star product. There are 30 base cards per pack, so with perfect collation, you would need to buy 34 packs to get all 1,000 cards. At $25 a pack plus shipping, that is a minimum (assuming you have trading partners) of $850 to collect the base set. In the past, I have paid maybe $40 or so to collect a mini-set. What a big money-grab this year by Topps. I think there is little fear this will sell out. Also, it looks like there are about 307 of each base card printed, based in there being a total of 41 parallels for each card = 41,000 parallels, divided by 4 per pack = 10,250 packs available, times 30 base cards per pack = 307,500 total base cards printed, divided by 1,000 cards per mini set, so 307.5 sets. Somewhat rare but I can’t see trying to build a set anyway. For who, for what? Poor print quality. 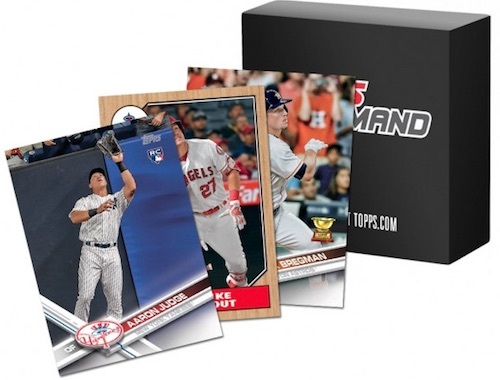 Also, Topps’ website says each box has four numbered parallels, and then proceeds to list four different types of numbered parallels (/25, /10, /5, /1), which led me to believe you would receive one of each. In hindsight, it’s more obvious that there are more than just 1,000 boxes, but the website was deliberately opaque. Ultimately, it was really disappointing to receive three /25’s (all #14/25, showing incredibly poor collation) and a weak /5. Don’t buy secondhand.